Everybody poops. I don’t care how rarely you hydrate. You poop. It is a fundamental aspect of human biology. And since the aliens we’ve seen in the Arrowverse seem to consume matter, we can assume they poop too. 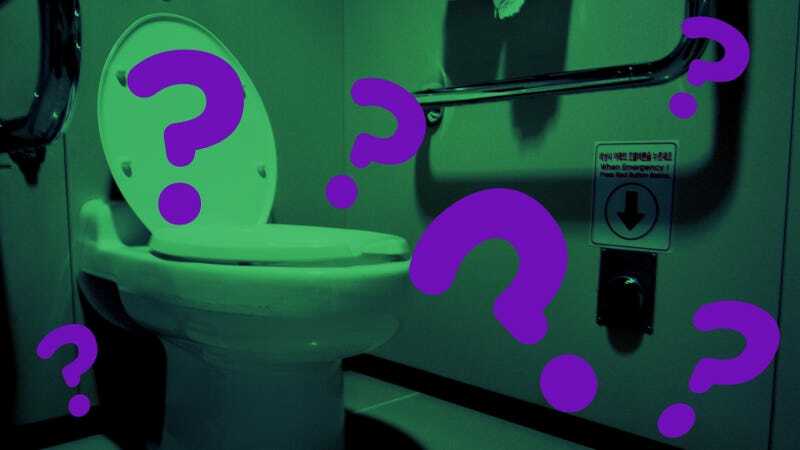 In fact, the only people on Earth who do not appear to poop are the CW set designers responsible for the extrajudicial prisons on Arrow, Supergirl, and The Flash. Besides denying individuals the basic rights provided for any other sentient resident of the United States—stuff like a fair trial—these prisons appear to deny these poor people a place to poop. This lack of facilities has been an issue that’s plagued me since Ollie first tossed his old pal Slade Wilson into an island prison. (It also introduced other questions—like who is the unlucky sap that has to feed, clothe, and care for Lian Yu’s incarcerated assassin?) So naturally, I’ve done what any good reporter would do. I have investigated. Let’s start with Arrow. This may surprise you, as the lead of Arrow is a charming serial killer and his wife once murdered an entire town with a nuclear bomb, but the heroes of Arrow generally maintain excellent incarceration practices—namely by turning their charges over to the actual police. All Images: Warner Bros. - NO TOILET? We have lightened the image to better showcase his prison. That’s Slade behind bars and there is clearly NO toilet in sight. Still no toilet in sight! But there’s something else to notice. This isn’t an L-shaped cell as I originally assumed. It’s U shaped. Slade wakes up on a bed and then circles around to this final point. Here’s a helpful blueprint I drew. As you can see, there’s a stool there, but there will be a lot more stools on that floor soon, should he remain without access to a toilet. After realizing that this was a U-shaped prison cell, I went back to the beginning of the scene, where we catch a glimpse of the other side of the cell from behind Ollie. It might be kind of difficult to see, what with Ollie on a stool and two sets of bars in the way. That’s a TOILET. It’s easy to miss as we only see this shot once, briefly, but Oliver Queen actually left Slade with a pot to piss in. Which is more than can be said for the doppelganger of Ollie’s ex! In season five, Team Arrow imprisons Black Siren, an evil version of Laurel Lance from Earth 2. It’s bleak as prisons go—particularly as we get a chance to see the entire thing once she busts out in the exact same episode she was imprisoned in, and realize that in addition to no toilet, she’s also denied a bed or even a chair. Now that we’ve established that Oliver and company like to deprive people of toilets, let’s examine the prisons of Supergirl. Its first season was also fond of the stand-alone cell in the middle of the base that has zero recourse for prisoners seeking toilets or anything approaching a bed. In the Supergirl episode “Strange Visitor From Another Planet” we get a very clear image of the prison used by Supergirl’s friends (and sister) at the DEO. As prisons go this is a confusingly-lit one, so it’s actually difficult to tell what is happening in that cell besides a White Martian raging. We could assume that while the DEO has denied the Martian access to water and a bed, it has at least provided benches. Perhaps these benches have lids. Perhaps those lids can lift up to reveal a toilet. It is possible! The shot is quick and we can’t gather many details. We also don’t have many details on White Martian digestive systems, though a more recent episode of Supergirl did reveal Green Martians can hold it for a long time so maybe this isn’t cruel and unusual punishment. We get a clearer look at the cell a few episodes later. Here, we learn that what appears to be benches are actually the result of the weird lighting incorporated into the prison cell. That’s because the DEO helpfully provides Maxwell Lord, a human, with an actual bench. But let’s take a closer look at that bench. There is no hole for evacuating one’s bowels. Nor does there appear to be any kind of lid to reveal a toilet underneath. We see this prison cell type repeatedly in season one, and never, ever, do we see a toilet. But someone must have noticed, because in season two (and now in season three) the DEO relocates to the center of National City—and in the process, remembers to install commodes in the new prison cells. It’s unclear if this was a decision facilitated by the move from CBS to CW, or if a member of the team simply felt it necessary to finally supply aliens with places to relieve themselves. 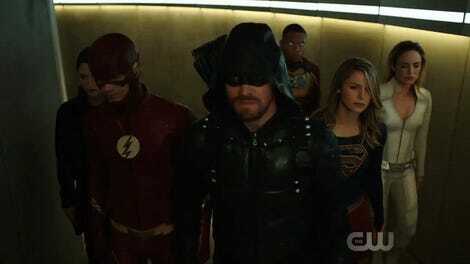 What is clear is that while Supergirl has improved things on the toilet front, and Arrow has regressed, The Flash has stayed constant, explicitly denying the metahumans it imprisons any sort of lavatory. 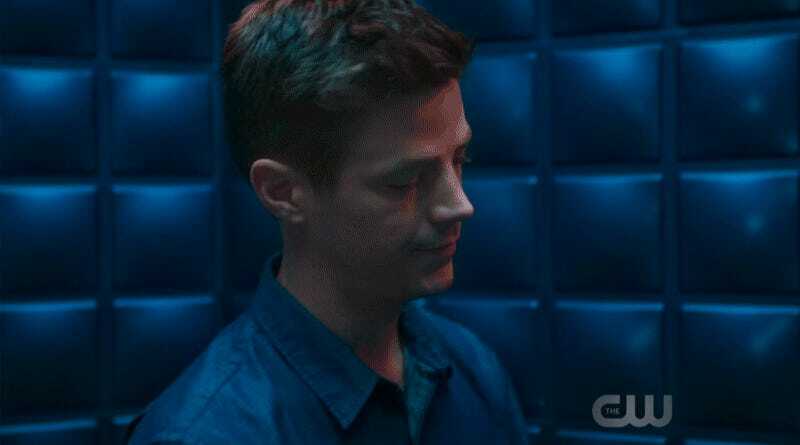 This is especially bizarre when you remember that in a season two episode, Barry offhandedly mentions moving Captain Cold to the “metahuman wing” of Iron Heights. Iron Heights is a traditional prison in the Arrowverse, so you’d presume the prisoners would have toilets, but in “New Rogues” we actually get a good shot of not one, but two metahuman cells at Iron Heights, and guess what is clearly missing. Things are just as bad for villains who avoid the prison industrial complex and instead stay at the facility located at Flash HQ known as “the Pipeline.” All metahumans were held there in season one, but since then those indefinitely confined there are prisoners “too dangerous” to be kept among the typical metahuman prison population—usually because they know the Flash’s secret identity. The show has repeatedly given us glimpses inside the tiny containers prisoners are held in. But during the recent four-part CW superhero crossover, The Flash actually showed us a number of the cells lined up, revealing a decidedly facility-free form of incarceration. Note that you can see nearly the entirety of each of those cells. Note that there is no space for a toilet. Still not sure? Here is another angle, also taken from the crossover. Which raises an important and as yet unanswered question. 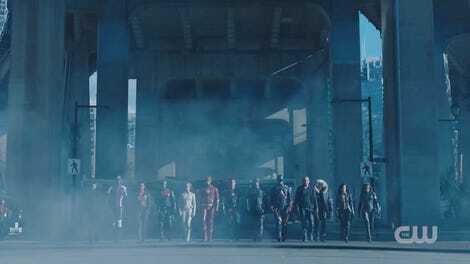 Where do the villains Team Flash have locked up actually evacuate themselves? Where do they eat, for that matter? Where do they stretch their legs? How can Supergirl spend an entire episode on how wrong it is to hold people extrajudicially, but The Flash imprisons whole swaths of the population without blinking an eye? Have a tip? Know more about where The Flash and Arrow put the toilets for the people they hold without due process or trial? Please let me know at alex.cranz@gizmodo.com. Update 12/10/18 — Since first reporting this story last year we’ve received new information—namely that The Flash’s illegal prison is both recognized as such by Oliver Queen (who vocally disagrees with its use perhaps due to his own recent seven-month stint in prison), and that it actually has a toilet that is hidden in the wall of each cell...despite the above image showing that those cells do not have enough room on either side to fit such a commode. So now we are left with additional questions. How does such a large toilet fit in such narrow walls? Does its presence affect the meta-dampening abilities of the cell? How do the prisoners even know it is there when there is zero visible documentation? Does the Flash simply provide a tutorial on the toilet’s use when gloating to recently capture prisoners? These questions continue to remain unanswered.